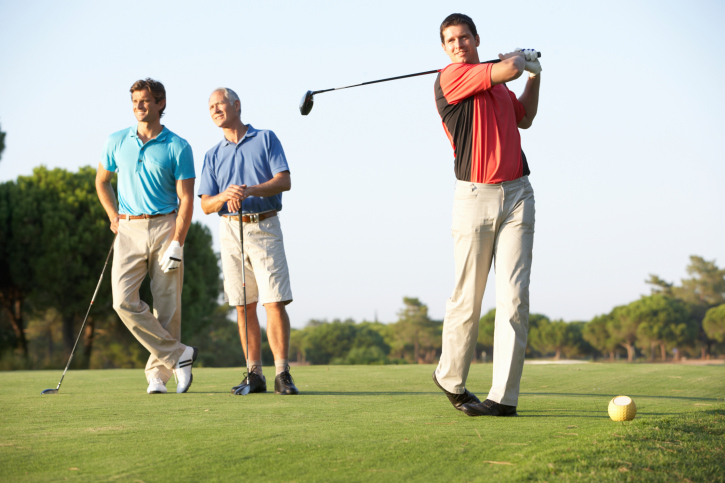 Playing golf is a great way to stay active and keep healthy. But how many calories are you really burning while hitting the links? The short answer: it all depends on how you play the game. No, we’re not talking about how far you drive the ball from the tee, or how many strokes it takes to get out of a sand trap, but factors like carrying your clubs and walking versus using a cart make all the difference. In addition to burning calories, there are plenty of other ways playing golf can benefit your health! Walking an average course for an 18-hole round of golf is the same as walking about 4 miles. Pulling or carrying your clubs on top of that, and you’ll be getting an even greater workout. Playing golf can help you stay fit, improve muscle tone and endurance, and lose weight and body fat. Golf can also help to reduce stress (although some golfers may say a frustrating round can cause stress, too!). And walking in an open and natural environment, like a golf course, has been proven to reduce stress levels. Also, playing with others who love golf too is a great way to relieve stress, and is a good source of camaraderie. Golf is a favored sport among mature players because it can be a leisurely yet competitive, activity with a low risk for injury compared0. Although golf requires quick jerking movements with the knee and lower back, warming up and stretching before a round can help significantly reduce these risks. Reminder: If you’re interested in trying golf, be sure to talk to your doctor first. Whenever you start any new fitness plan or activity, such as golf, you should always check with your doctor to make sure it’s safe for you to do. Looking for more fun fitness ideas? If you’re a Health Advocate member with access to our Wellness Coaching program, call us for one-on-one guidance getting started with exercising.